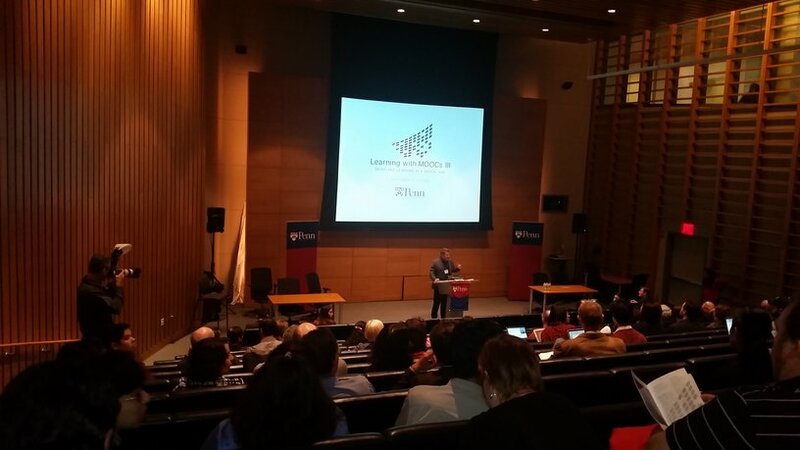 A few weeks ago, I had the pleasure of attending and presenting at Learning with MOOCs III at the University of Pennsylvania. I missed the first year of the conference, but enjoyed presenting at the second event at Teachers College. Last year’s talk primarily focused on multiple pathways research coming out of the 2014 DALMOOC and I received some good feedback. 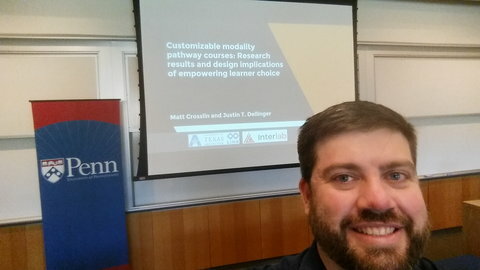 This year, Matt Crosslin and I presented on multiple pathways/customizable modalities research that also included data from the 2015 HumanMOOC and ongoing work from my for-credit fully-online history courses at the University of Texas at Arlington. Our program session on Multiple Learning Pathways was full of lively discussion and I enjoyed hearing from the other presenters. From the questions, I could glean that most see the value in attempting this level of personalized learning, but simultaneously recognize the challenges. I am excited that I get to continue my research going forward, in particular collaborating with Dragan Gasevic, Nikola Milikic, and Kim Breuer. For more information on customizable modalities pathways courses, please see Matt’s blog. One of the more interesting elements of LWMOOCsIII was the shift in program focus that reflects a more mature field. This year, LWMOOCs echoed the work of George Siemens of the LINK Lab by asking what it means to be human and to learn in a digital age. The purpose of this theme was to broaden research in the field to more accurately reflect society’s transition to more of a digital, data-centric life. The shift in theme elucidates important new areas of study, including privacy and data ownership, virtual/augmented reality and simulation, learner pathways, social and affective dimensions of online learning, the roles of learner, teachers, and institutions, and much more. MOOCs have entered into a post-hype period and for some, are no longer seen as a possible savior of education. Instead, they can be used in a number of relatively clear ways, ranging from revenue generating machine to experimental/pedagogical playground, and the number of course offerings has continued to grow (for better and for worse). It is important that learners, researchers, and institutions recognize the differences between the purposes of MOOCs, because the mindset of some that see MOOCs as only one solution, path, etc., will miss the bigger, more complex picture. At the event, for example, I heard a number of people continue to discuss the idea of MOOC completion rates applied broadly. We see it in reports on education and MOOC detractors decry numbers that typically range between 5-15%. Even when authors do recognize contexts, idealism can overshadow it. In their 2015 article, Greene, Oswald, and Pomerantz note that there are different types of MOOCs, that most participants are college-educated males from first-world countries, and that the idea of retention is problematic in this environment, but still try to find empirical answers to increase learner course completion under the myth of MOOCs reaching “their purported potential for transforming formal education” (p. 926). This is essentially doing research in the scope of hype and not the reality of what different learners really want. More useful research could be to look at something like the effectiveness of free instructivist courses with frequent offerings geared toward low-income minority students rather than lumping this type of course in with one focused on high-level data and learning analytics using experimental pedagogical approaches. I am not arguing against examining completion rates for certain types of MOOCs, particularly for companies and institutions that seek to monetize elements of their courses or need to justify what could essentially be a six-figure investment beyond the guise of serving the public good. However, it is important to look at MOOCs in their contexts rather than as a whole. 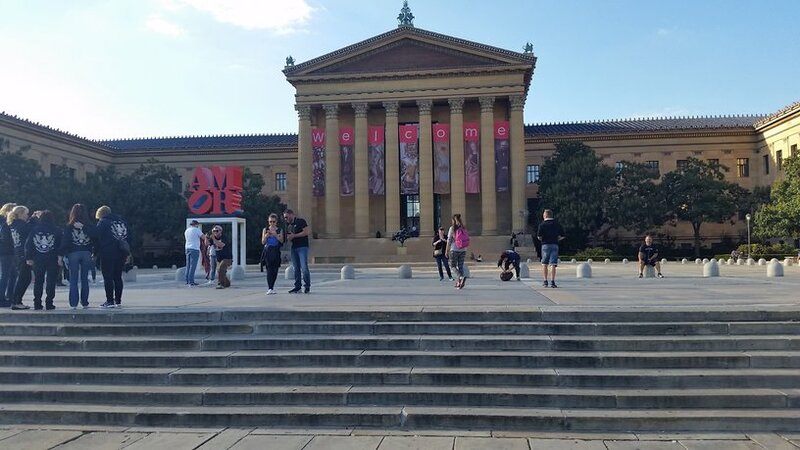 And yes, I did run the Rocky steps while I was there! Gonna fly now, flying high now, gonna fly, fly, fly.